Penetrating eye trauma, autoimmune disorders and syndromes are just a few possible underlying causes for anterior uveitis. 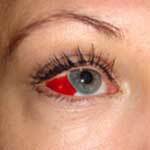 Anterior uveitis symptoms might lead to bloodshot eyes causes, sudden dull pain, sensitivity to light and blurred vision. While acute cases of anterior uveitis mostly have traumatic in nature causes, chronic iritis, on the other hand, is believed to have systematic autoimmune disease causes that result from a person’s own immune system cells attacking seemingly healthy eye tissues. Microbial keratitis triggered by a number of pathogens that could be viral, bacterial and fungal in nature could be a preceding condition which might lead to anterior uveitis without proper diagnosis and treatment, especially accompanied by penetrating trauma involving soil or plant matters. Anterior and posterior uveitis (inflammation of the internal part of the eye) is treated by topical corticosteroid drops, ointments and oral medications. Chronic anterior uveitis related to autoimmune system disorders might require additional immunosuppressant drugs to relieve symptoms. Outlook for anterior and posterior uveitis is good, however it may take months with proper treatment to resolve. If damage to eye tissues due to inflammation was considerable, surgery might be necessary to restore vision.